In lieu of flowers memorial donations may be made to the American Cancer Society and left at the funeral home. Willie “Buddy” John Shaw, age 67, of Olathe, Kansas (formerly of El Dorado Springs, Missouri) passed away at Olathe Medical Center on June 29, 2014. Buddy was born July 9, 1946, to Jake and Eula (Julian) Shaw. He was the youngest of twelve children. Bud lived in El Dorado Springs until 1971, when he and his family moved to Olathe, Kansas. Buddy married Margie Knapp in El Dorado Springs on January 31, 1967. To this union three children were born. They divorced in 1990. In 1994 he married Anita Dennis. Anita had two daughters, Crystal and Jessica. They divorced in 1995, but remained friends. After moving to Olathe, Bud worked and retired from Johnson County Aggregates. He spent his life hunting, fishing, and canoeing with family and friends. 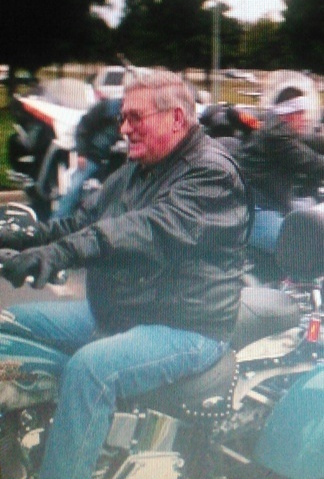 He especially enjoyed riding his Harley and participated in many bike runs. Preceeding Bud in death were: his parents, one brother, Sam Shaw, six sisters: Prudy Keith, Viola Marshall, Ada Vrbanic, Wilma (Betty) Tompkins, Wanda Keith and Martha (Ty) Shaw. Survivors include his three children: John Shaw and wife Juliet of El Dorado Springs, MO; Robert Shaw and wife Pam of Clinton, MO; and Angela Walters and husband Anthony of Fulton, KS; seven grandchildren: September McCool and husband Adam of Parker, KS; Matt Hardman and wife Kaitlyn of Ellis, KS; Jessica and husband to be Jaret Thorpe of Ft. Scott, KS; Logan Shaw of Clinton, MO; Delaina Walters of Prescott, KS; Chase Walters of Fulton, KS; and Hannah Shaw of Clinton, MO; six great-grandchildren: Madi, Addie, Maycie, Boston, August and A.J. ; one brother, Carl Shaw and wife Aleyne of Edwards, MO; three sisters: Ruby Janes and husband John of El Dorado Springs, MO; Oma Biggs of Nevada, MO; and Rena (Janie) Shaw of Monett, MO; and many aunts, uncles, nieces, nephews, and cousins. Funeral services for Buddy Shaw will be held on Thursday, July 3, 2014, at 10:00 a.m. at Bland-Hackleman Funeral Home with Rev. James Coleman officiating. The family will receive friends on Wednesday evening from 6:00-7:00 p.m. at the funeral home. Burial will be in White Hall Cemetery under the direction of Bland-Hackleman Funeral Home. Pallbearers are: Logan Shaw, Matthew Hardman, Chase Walters, Jaret Thorpe, Frank Keith, Rick Tompkins, Larry Lee, and Adam McCool.